Habitat: European ash is native to Europe. It grows best on fertile, wet sites. 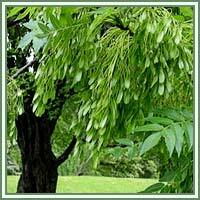 Description: Ash is a slender, deciduous tree. It grows up to 35 meters in height. It has a light-gray bark and grayish green, hairy branches. Dark green leaves are pinnately compound. Bisexual white flowers are without petals. Fruit is 4 to 5 cm long, oblong and winged. Parts used: Leaves, bark, seeds. Useful components: Vitamin C, sugar, coumarin, minerals (iron, copper, potassium), bioflavonoids, tannins, rutin, resin. diaphoretic and purgative. 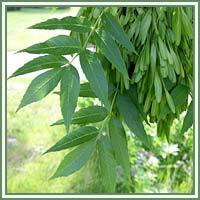 They are used in cases of rheumatism, gout, dropsy, obesity, kidney stones and jaundice. Safety: Pollen of the Ash can cause allergic reactions.Some herbs could interact with certain medication. It is advisable to consult your doctor before consumption of any herb.